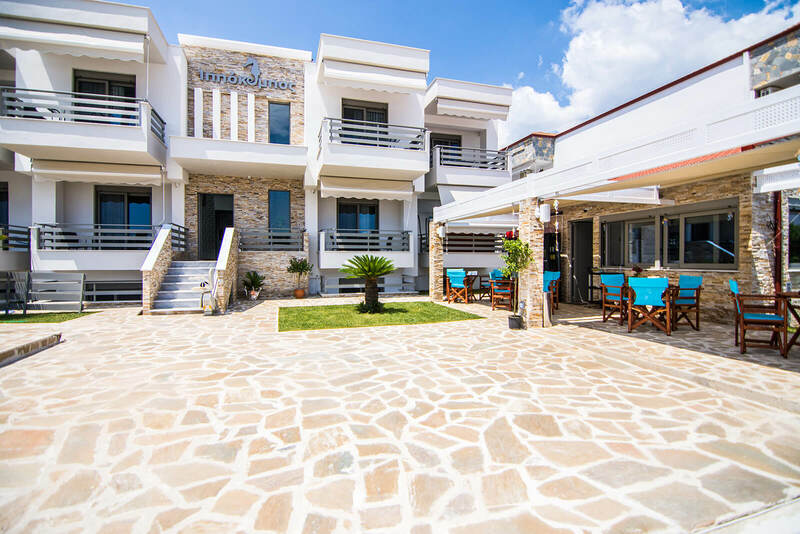 Ippokampos Resort is a newly built hotel, located on shore in Nea Vrasna. Modernly decorated, the Luxury Rooms of Ippokampos Resort are equipped with all the necessary amenities to offer luxury vacation to its residents. Fully equipped kitchen with refrigerator, flat tv with satelite channels, private balconies with amazing sea view, air conditioning, private shower/wc with 24/7 hot water, are going to win your heart for ever. Our residents can enjoy their iced coffe, beer or refreshment on our cafeteria. They can also use our organized beach, right in front of Ippokampos Resort. The sunbeds and umbrellas are with no extra fee for our residents. Ippokampos Resort is ideal for families, who want to spent every day on the beach.